The peculiar logic of the content marketer Justified critics of established mass media? Or just lobbyists for their own cause? Abstract: Again and again, leading names in content marketing (CM) have questioned whether the media system in Germany is fit for purpose. They claim that journalism is under-resourced, not independent, and active only in user-unfriendly filter bubbles. In contrast, they say, content marketing – advertising using journalistic means – is user-friendly and beneficial. In fact, “corporate journalism” is often of higher quality, they argue. However, analyzing their arguments shows that the logic of CM lobbyists is often skewed. “#Journalism: Many a content marketing project could replace the media, since we don’t have to pay for them,” tweeted Klaus Eck on July 4, 2018. Eck is the boss of the Munich-based agency d.Tales, which offers advertising through journalistic means – otherwise known as content marketing (CM). [i] Eck is known not only as a proven expert who has compiled his expertise into various guides to CM (cf. e.g. Eck/Eichmeier 2014), but also as a leading lobbyist for a group of people who want to legitimize this specific form of commercial communication to an expert audience. Eck’s pithy statements have repeatedly attracted attention in recent years, establishing him as a public champion of content marketing. Eck is certainly not the only representative of the sector campaigning in public. Karsten Lohmeyer, for example, until the start of 2018 Chief Editor at The Digitale, Deutsche Telekom’s CM agency, put his point across in feisty blog posts and with assertive panel performances in which he claimed that traditional media had lost almost all their independence. Another leading CM lobbyist is Andreas Siefke, Chair of the Content Marketing Forum. Siefke emphasizes that CM is “corporate journalism” that faces traditional media titles on an equal footing at the very least. The thrust and objective of statements like these are always the same: They are intended to feed and reinforce doubts about journalistic media’s fitness for purpose. In addition, they aim to gain greater recognition for content marketing as an unavoidable alternative to journalism, entirely equivalent in terms of both function and quality. It is clear that the CM lobbyists are speaking out not as neutral experts, but always pro domo. However, this does not in itself mean that their views are distorted or even wrong. So how justified are CM’s claims and this criticism of journalism? In order to find out, this paper analyses how plausible and accurate various core statements, represented by relevant quotes, are. 1. Content marketing is pushing journalistic content out because it is free. Eck’s comments are based on the assumption that Knüwer’s dark prediction actually comes true. However, there is plenty of reason to doubt his forecast – it is more of a polemic for exaggerated effect. After all, as we know, prices left to market forces are governed by supply and demand. The crucial aspect in this case is what is known as the elasticity of demand: When a certain price level is reached, demand drops and sales collapse. In the real world, this means that neither printed daily newspapers nor digital paywall models are likely to exceed certain price levels. A media world in which financial and functional elites are the only people who can afford reliable information seems an extremely surreal prospect. In addition, journalistic products are hardly suitable as luxury goods, whose primary function is to create a social distinction. Newspapers and magazines are not comparable with Louis Vuitton handbags or Brioni suits. Instead, the great majority of the media (with the exception of glossy magazines) are mass-produced goods for which users do not want to pay much – few consumers pay more than one hundred euros per month. This alone reduces the credibility of Knüwer’s theory. The theory also claims that the only alternative to traditional media is fake news producers and politically radical websites. Surely Knüwer would not consider his own blog among this phalanx of extremists? The fact is that, despite some paywalls, the majority of serious online journalism remains available to users free of charge. Also undeniable is the fact that many traditional media failed to get on board with digitalization at the start, with some media houses making strategic errors in introducing new profit models. However, the main hurdle facing managers, editors and authors is the free-of-charge culture of the internet, which was established early on and will be almost impossible to change 25 years later. Although most consumers love to do their shopping online, only a handful are willing to pay for services offered on the internet itself. This is the fundamental dilemma facing journalistic media. Although basic information about key events and developments are available all over the internet, credible verification of this information, a balanced context or exclusive research providing new information are not only a journalistic service, but also demand investment in the form of finance and staff. These costs need to be covered by takings, so it is no wonder that journalistic media want to see users pay for their ‘refined’ information. Ways of doing this include advertising on the website, paywalls, and license fees for public service broadcasters. In order to gain ground in this difficult situation, all (apparently) free alternative services need to thwart the efforts of classic media. However, an important distinction needs to be made: So far, content marketing has only attacked political and business journalism in a few isolated cases. Instead, CM is largely expanding in the usual playgrounds of popular culture – in fashion and lifestyle, and above all in fields in which traditional journalism previously held a kind of monopoly as a source of advice – from medical advice to which new smartphone to buy. While users of test.de have to pay Stiftung Warentest a few euros to download a full product test, they can get it for free from electronics chain Saturn’s Turn On or mobile provider Telefónica’s Curved – without ever knowing exactly what is behind these ‘tests’ and what the (perhaps) commercial interests of the testers are. Having said that, the CM services only appear to be free of charge. The content of topic pages, blogs and videos is created by agencies like Klaus Eck’s d.Tales – a service for which the advertising companies pay a lot of money. This comes from the budget of the PR departments or, even more frequently, from marketing. Just like in the case of classic advertising, all the costs for this ultimately influence the sales price of the products that the content marketing is intended, at least in part, to promote. One consumer might want to use Turn On for information and then purchase his new tablet not from Saturn, but from a competitor. Another, who does buy from Saturn, is helping to pay for the ‘invisible’ advertising. This eternal principle of advertising works just the same way in content marketing as in traditional methods. When a company puts an advertisement on a journalistic news site, the costs are also passed indirectly on to the customer – regardless of whether he as a media consumer has paid attention to the advert or not. Whether it is media financed by advertising, those that work more with paywalls and subscription models, or content marketing, companies that advertise incur costs that they then hope and indeed need to recoup through the sales price. Klaus Eck’s tweet might therefore appear logical on first reading, but it is ultimately a naïve calculation. 2. Traditional journalism is in a terrible state. Companies therefore have to go to greater lengths to establish their own channels of communication in order to be heard. In an interview about the relationship between journalism and public relations (PR), Eck claimed that, “If the media are no longer accessible for companies, because the editorial offices are overstretched and have little time for the needs of PR, then PR practitioners have no choice but to publicize their topics actively in order to reach their respective target groups. This turns press staff into content marketers” (Duran 2018). Eck considers specialist media largely superfluous, as they usually consist of thinly-staffed editorial offices simply placing ‘guest articles’ from companies in their publications (Sohn 2017). Eck’s conclusion on journalism today is overwhelming negative. “Trust in the media has suffered at the hands not of content marketing, but of apparently poor journalism. Many media consumers want to see their own reality reflected and are disappointed when journalism offers them something outside their own filter bubble.” But the agency chief then goes on to qualify his statement, admitting that journalistic media have regained some trust. Karsten Lohmeyer, formerly an editor for television magazines produced by Hubert Burda Media, is even tougher on traditional media. “I would never consider content marketing journalism in the pure, true definition of the word,” he writes. “But the same applies to what feels like around 95 percent of that which calls itself journalism these days.” He goes on, “A large proportion of the mishmash of media produced every day consists of trivial entertainment, rehashed press releases, poorly-researched user value and, sadly, all too often poorly-camouflaged product placement” (Lohmeyer 2017). Later on, he complains that journalists are only interested in a “good story” and pay no attention to search engine optimization (SEO) or expanding reach (Sohn 2017). The message behind all these quotes can be consolidated in a few key messages: Traditional media work with editorial offices that are barely fit for purpose. The journalists that work there are too interested in their own stories and not in their audience. This self-centered view has lost them credibility. The majority of traditional media is not independent anyway. So is there any truth in these claims? Are they disparaging journalistic media unfairly? Or is their criticism essentially justified, if a little over the top? It is undeniable that the media has suffered a structural crisis since 2002. Although intervention from the media houses has gone some way to limit the damage, the crisis is far from over. The challenge of the internet, the associated loss of advertising markets and the sometimes erratic search for new profit models has led to often painful falls in sales and profits, especially for daily newspapers. However, only a handful of editorial offices have had to close completely. Although there have been significant job losses, these have largely been the result of media houses making much better use of synergies than before – for example by having just a single correspondent office in Berlin that supplies all titles with articles, rather that multiple separate offices. There is no doubt that the level of staffing in some editorial offices is not ideal. The image of a two people sitting in an office putting together guest articles for a specialist magazine, so smugly described by Klaus Eck, has always had a grain of truth to it, at least for smaller titles. A more recent and more worrying trend, however, is for local and regional newspapers to publish sometimes totally unedited press releases as news – a clear violation of the German Press Code. The influence of advertising and commercial concerns on local reporting seems to have increased in general (cf. Arnold/Wagner 2018: 190ff.). It is easier for companies to make themselves heard when there are so few staff in the editorial offices. But it does not mean, as Eck claims, that commercial communication will be forced to rely on its own channels in future – quite the opposite. The credibility crisis in the established mass media Eck describes is primarily down to the radicalization of parts of German society. First via social media and increasingly in online magazines (Compact etc. ), political forces on the left and especially the right ‘fringes’ have attempted to create an alternative public sphere by villainizing the established media as “lying press” or “mainstream media.” However, there are other reasons why between a quarter and a third (depending on the survey) of people in Germany have doubts about the credibility of traditional journalistic mass media (cf. Otto 2017). These included (and still do in some cases) a lack of willingness to enter into active dialog with media users and to address their needs. However, significant progress has now been made here, negating Eck’s argument that most journalists have nothing to offer media users except their own filter bubble. Quite apart from this, journalistic media have a public duty to promote the formation of public opinion. This necessarily means that relevance at least sometimes takes precedence over clicks and apparent public popularity. Klaus Eck paints a picture of editors providing publicity and ignoring the real-life concerns and social needs of most people. Such an image triggers associations with the groundless accusations of those spreading propaganda about the ‘lying press’ and cannot be what Klaus Eck means. One clear indication of this progress is that fact that, today, the standards of good journalism dictate that editors do not simply blindly pursue their own story in a narcissistic manner, as Karsten Lohmeyer claims, but instead make sure that stories achieve the greatest possible reach. Some editorial offices now compose texts based predominantly SEO criteria rather than questions of style. Reach in the form of the highest possible click rates plays an increasingly important, even excessive role in some media houses. Some, for example, publish a list of the articles with the most clicks internally every day. They are clearly placing reach before relevance – and not always correctly. It is difficult to see why Lohmeyer puts such emphasis on reach, given that content marketing products usually achieve much lower click rates or noticeably lower rankings on search engines when they compete with comparable journalism. This, too, is likely to be connected to credibility. So what about Lohmeyer’s allegation that “what feels like” 95 percent of journalist media consists of trivial entertainment, rehashed press releases, poorly-researched user value, and barely-camouflaged product placement? This damning assessment is nothing more than a hugely distorted vilification of a profession whose importance and fitness for purpose becomes especially clear when one looks at countries like Russia, China or Turkey, which do not have a system of free and pluralistic media. Alongside features such as periodicity and topicality, there are two key features that define journalism: editorial independence and neutrality. In terms of their work, this means that journalists make every effort to achieve truth and authenticity, conducting research and providing information impartially, carefully, completely and with no predetermined result. In addition, the journalistic duty of care demands that all relevant sources are consulted and competing perspectives on the topic in question offered. Content marketing does none of this. A certain gap between ideal and reality, between academic standards and professional practice, is inevitable. What ultimately counts is how close to or far from independence or dependence the individual fields are in the real world. Here it is clear – both subjectively and objectively – that the traditional media are still much closer to independence, certainly closer than corporate publications are. Admittedly, there is nothing to say that it will remain this way for ever. The system is dynamic. There are certainly some developments we should be concerned about, for example at Gruner + Jahr, one of Germany’s leading magazine publishers. Over the last few years, the media corporation has not only hugely expanded its content marketing unit Territory, but also brought its magazines strictly into line with commercial criteria. Their journalistic independence has not always come away unscathed. Even more serious, however, is the fact that, through its business policy, Gruner + Jahr is single-handedly helping to blur the line between journalism and commercial communication. On the one hand, the group publishes celebrity-focused magazines like Barbara (Schöneberger) and Gesund leben (Eckart von Hirschhausen), which follow journalistic standards. On the other, the CM subsidiary Territory publishes the lifestyle magazine BOA, all about football star Jérôme Boateng. How clear is the distinction between journalism and PR here? Do the magazines differ significantly from one another? In this sense, Lohmeyer’s view is right: There are undoubtedly worrying trends. However, using these trends as the basis for such a sweeping judgment is irresponsible. And after all, content marketing does not gain legitimacy simply because some journalistic media are opening up more to commercial and advertising interests. 3. Content marketing is in direct competition with journalism and in some cases even has the upper hand. What these quotes all boil down to is this: Journalism and content marketing are in direct competition with one another. Journalistic media are sinking into mediocrity, while CM media are being promoted to the ‘Champions League’ and can act as a stimulus for journalism to display greater quality once again. As such, content marketing could actually play a positive role for society in a sense. Statements like this are the logical conclusion of a chain of arguments that criticizes and attacks journalism in order to legitimize content marketing and present it as an equal competitor. There is certainly a debate to be had about quality and standards like style and depth of research. For all these arguments, however, there is no doubt that, although content management uses certain journalistic tools, it also differs significantly from journalism: It lacks institutional independence and neutrality. There is therefore a clear dividing line between the two fields. Content marketers have to define quality primarily based on external features of journalism – and, in case of doubt, on how penetrating a text on how to air a home properly is in describing the benefits of the underfloor heating that the company paying for advertising produces. An analogy from another sphere of society is useful. While both have a law degree, a defense lawyer and a state prosecutor have completely different roles before a court. This division of roles is completely clear to any observer – but in public communication, the producers of content marketing want to blur the distinction between these vastly different roles as much as possible. In doing so, they hope that media consumers do not really mind whether the content comes from the keyboard of a journalist or a content marketer. These conditions would indeed create a competition situation. All this hangs on the users’ media competence and especially their awareness of advertising. But it is secondary. First, the CM sector should and must create the greatest possible transparency around the content they offer. The oft-quoted example of Curved is not a one-off, as Siefke claims – there is a great deal of CM content for which it is not immediately or not at all clear who is behind it. This is often intentional, since media users are much less likely to find content credible if they can immediately see that it has been produced by a company. Despite this, clear labelling is essential if we are to achieve full transparency, so that users are truly free to decide whether or not to make use of a service. Although the German Public Relations Council (DPRR) and the German Association for the Digital Economy (BVDW) have issued a relevant Code of Ethics, it is very generic, even on the key question of transparency. 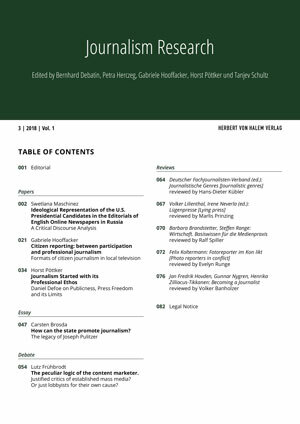 Gabriele Hooffacker therefore suggests that PR practitioners, including content marketers, should subscribe to the more precise and comprehensive German Press Code (Hooffacker 2017). When looking for information and tips on practical topics, however, it is often difficult for media users to spot these intentions. This becomes a problem when not only companies, but also associations become involved in politics using journalistic means. Rundblick – das Politikjournal für Niedersachsen (www.rundblick-niedersachsen.de), for example, appears at first glance to be a traditional, journalistic online magazine focusing on topics in state politics. Even at second glance, the legal notice lists the Hanover-based Drei-Quellen-Mediengruppe as the publisher. Only right at the end of the very long text in the “About us” section is it mentioned that Rundblick is created by the trade association NiedersachsenMetall. The text promises that “The publisher guarantees journalistic freedom and is not involved in reporting.” It is certainly true that the magazine rarely looks at topics directly related to employers in the metal industry. However, it is not difficult to see that the reporting is from the point of view of business. The project is reminiscent of earlier attempts by the Initiative Neue Soziale Marktwirtschaft to influence economic policy across Germany. The analysis has shown that content marketing lobbyists are making use of the structural crisis in journalistic media in Germany for their own benefit, often working with exaggeration, distortion and even half-truths. Their main goal seems to be to enhance the status of commercial communication in the form of content marketing at the expense of journalism, whose fitness for purpose is presented as questionable. At the same time, professional journalism needs to produce quality as high as that of comparable CM products – in terms of external form – and make sure to prove its worth with its unique selling point of independence. In all this, it is noticeable that CM lobbyists often react to even the slightest supposed criticism of their form of communication. There is no broad-based public rejection of content marketing. The only people to have voiced public criticism so far are Handelsblatt correspondent Hans-Peter Siebenhaar (Siebenhaar 2017) and Johannes Vetter, former spokesman of the state-owned Austrian company OMV (no ref. 2016). In addition to this, only a single critical academic survey of the topic has been published – by the author of this article (Frühbrodt 2016). Also surprising is the often polemic undertone in the testimony of CM apologists. Representatives of the public relations sector are the ones who are most vociferous in demanding that companies both provide and receive dialog-oriented communication in public matters. The discourse on the relationship between journalism and content marketing gives them the opportunity to enter into a constructive dialog. A more professional tone would be a useful first step. Duran, Dilan: Klaus Eck zu PR und Journalismus: “Unternehmen kommen um den eigenen Content nicht herum!”. In: PR Fundsachen, 13.03.2018. How can the state promote journalism?